Luigi Barzini, Sr. (1874-1947) was an Italian journalist for, among other publications, the Milan-based newspaper Corriere della Sera. He was a war correspondent during the Boxer Rebellion in China in 1900. Between November 1901 and September 1902 he filed a series of dispatches from Argentina that were then published in 1902 in book form as L'Argentina Vista Come È [Argentina, Seen As It Is]. I am not aware that the entire book was ever translated into English. I have chosen a very few pages (pp.160-164) that deal with southern Italian immigrants in Argentina at a time when there was a massive flow of Italians leaving Italy for North and South America. Some sources say that as many as nine million Italians left Italy between 1900 and the beginning of WWI; many, perhaps most, of these were from the south. The Corriere della Sera had published earlier features on emigration to North America. 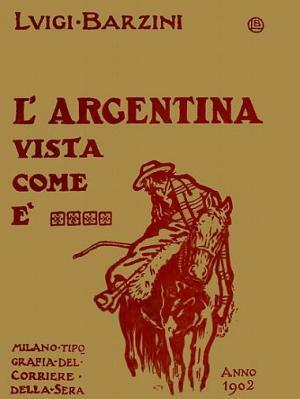 Barrzini's premise in the book was to make Argentina, a land that was taking so many Italian emigrants, more familiar to the Italian readers at home, but also to express the view that such emigration is a great loss for the mother country, apparently unable or unwilling to do anything to stop it. I have left Barzini's original Spanish use of the term Criollo or Criolla. Although it is related to creole, in the Argentine use, it means a social class in the overseas colonies established by Spain in the 16th century in Latin America and refers to locally born people of pure or mostly Spanish ancestry. The Criollos ranked below that of the Iberian Peninsulares, the high-born (yet commoner) colonists born in Spain but permanently resident in Argentina, but Criollos had higher status than other castes — i.e., people of mixed descent, Amerindians, and Africans. The damages that we have suffered from this emigration are both material and moral. The material: Italy has more than one million of her children in Argentina—or one-quarter of the population of the Republic [of Argentina]—non counting their descendants; yet, Italy ranks only fourth in imports from that country and seventh in exports. The moral damages are more serious: in Argentina, they judge us on the basis of our emigrants. Argentines are the children of Spain, in debt to England, a satellite of France, clients of Germany, and they admire and imitate the United States; thus Argentines hold those nations in high regard. They don't know much of Italy (history and art are not really their strong suits) except that Italy sends down to Argentina boat-loads of her children—active, tireless and valuable, yes, but also poor and humble, two qualities to be scorned, particularly in a country where money and pride are everything. Italy is generally depicted by the criolla masses as an overcrowded country of the starving—almost a small China—that has to hold out its empty hand to rich and progressive America. Just look at the political allegories in the illustrated press, which depict magnificent Argentina protecting tiny Italy, and you understand how the average Argentine views the relationship between the two nations. "Ah, no!" said the professor, finally seeing what the young man was talking about. "They're all Neapolitans. Don't be silly." The young man couldn't conceive of such a thing as Neapolitans in tuxedos, evening gowns and diamonds, gathered in a splendid theater. For him, and for most of his fellow citizens, "Neapolitan" was almost synonymous with those who peddle wares on the streets, shine shoes and pick up the trash. It is easy to imagine how this, shall we say, lack of consideration from the natives might contribute to lowering the morale of our emigrants. The Argentines, by virtue of their Spanish nature, (which from a certain point of view can be very attractive) are supremely proud and convinced of their undeniable superiority over all other humans in the universe—and are used to hearing that about themselves. Even in their expression of friendship there is always an air of condescension and protection. When they are cordial, it's a kind of charity. When they say 'at your service', it's from a kind of knightly and exquisite upbringing, but they neither serve nor carry out your wishes unless it suits their own vanity. They may concede, but they never cede. A transaction between a foreigner and a "native son," always has the character of a transaction between a subordinate and a superior even it is gently wrapped in immaculate breeding. Furthermore, if those refined Argentines who make up the small ruling class prosper from the countless advantages they draw from our emigration—which they desire and encourage—the poor criolla masses spread throughout the countryside feel the disadvantages. Once they ruled the Pampas, which fed them with no need to work. Now, where there are Italians, roping a steer is theft. The settlers defend the fruits of their labor, and the gaucho is forced to go to work on ranches a few months a year. That offends his dignity. He harbors ill will against the gringo and may even vent his resentment with a pistol from time to time, something that too often goes unpunished. The situation of Italian workers, especially on the farms, is in a certain sense similar to that of Jews in some European nations. They go about their business freely but surrounded by a bland, latent hostility. All of a sudden, they find someone screaming "Jew!" at them as an insult. Down here [Argentina], they yell gringo. The Italian is called gringo, an insult with no real translation. Even the origin is uncertain. Some say it comes from griego—Greek. It seems that once upon a time in the early years of the last century, a group of Greek captains of industry disembarked in Plata, cleaned the place out and left. Since that time, foreigners have been called griegos as if to say—Watch out, friends! Thus, from griego we have gringo, and this term has been directed entirely at Italians. It has not been that long at all since the term might have been a mortal insult, but then there got to be so many gringos that the word lost much of its sting and turned into just another insult, something on the order of "rotten foreigner." There is even a friendly diminutive, gringuito. That, however, is often qualified by a filthy adjective that defies decent translation, as if they were trying to resurrect the original strength of the insult. An Argentine gets offended at being called gringo. All Italians are indistinguishably called gringo. It is a term currently in use. The worst kind of gringo is the tano, a corruption of the word napoletano. All southern Italians are called tano. The word is not really used by the better classes; it is abused in colloquial speech especially out in the countryside. Since the poor southern Italian emigrants from Calabria, the Abruzzi, Naples, and Sicily are the most miserable and least cultured, little by little the word tano came to be applied to the lowest of the low. Saying tano is like saying "miserable!" And there is no diminutive term of endearment of the word, no such word as tanito. Tano is always an absolute insult. An irritated Argentine might call you gringo to your face, but if he is enraged he might shout tano. This means that the words that correspond to "Italian" and "Neapolitan" are in the dictionary of insults. And that is something we cannot be very proud of. In the criollo theater, which is a recent derivation of ancient Spanish theater, you often hear the word tano. As in all folk theater, characters are stereotyped through comic devices and become "masks" of a sort. Among these, the tano is the one that provides comic relief: he is ridiculed by all, his speech is full of errors, and he is a bit of a "servant fool" like in the ancient Italian theatrical tradition, but more servile and more foolish; furthermore, he is a thief...and is beaten. That should give you some insight into the strange low level of our prestige in Argentina. back to series "Through the Eyes of..."